Fang was born in Guangxi province in 1992. 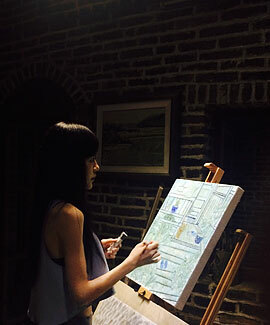 She studied art at the Guangxi Art Academy and was graduated in 2015. Fang is specialized in oil painting and after graduation, she continued to do research work on oil painting as well as the art of woodcut printing at the academy. Between 2012 and 2015, Fang participated in more than 20 art competitions and exhibitions in the country. Many of her artworks were awarded and subsequently acquired by galleries and private collectors. “Fang’s work of art spells fantasies of the young at heart, simple, carefree and innocent which are enjoyed by people from all walks of life,” said art critics.